Business News›Markets›Why are ethics important in the finance industry? The stock market scam of 1992 is considered one of the worst violations of ethics in the Indian financial industry. Retail investors lost money after the market was manipulated, and it subsequently lost 72 percent of its value. Despite serious consequences and convictions, a similar fraud in which bank and promoter funds were used to manipulate stock prices took place within a decade. At a global level, the financial crisis of 2008 pushed the boundaries of unethical practices with housing loans given to subprime investors. Its effects continue to be felt across the world even after a decade. Economic activity has not yet returned to trend in most countries and public debt in advanced economies has risen by more than 30 percentage points of GDP. Still, accounting frauds and market manipulations, Ponzi schemes, insider-trading, and other misdeeds continue to shatter investor confidence. There are many reasons why ethical violations occur. Sometimes they become the norm because “everyone is doing it.” Others happen when individuals take advantage of loopholes in the system. Ultimately violations are driven by the potential personal gain of the investment professional. Investors intrinsically trust financial institutions with their money and expect them to invest it with integrity. All market risks considered, investors expect the highest return and put their faith in the hands of professionals. Upholding investor confidence is vital to the success of the investment industry. High ethical standards are critical to maintaining the public’s trust in financial markets and in the investment profession. CFA Institute Code of Ethics and Standards of Professional Conduct outline best practices around professionalism and integrity of capital markets, duties to clients and employers, investment analysis and recommendations, and conflicts of interest and responsibilities.The Code of Ethics maintains that investment professionals must place the integrity of the profession and the interests of clients above their own, and act with competence and respect. Since their creation in the 1960s, the Code and Standards have signposted the integrity of CFA Institute members and served as a model for measuring the ethics of investment professionals globally, regardless of job function, or cultural context. Protecting investor interests and strengthening their trust is paramount. Ethical conduct is vital to the ongoing viability of capital markets. Regulatory reform may go some way to combatting the misconduct in the industry but that alone is insufficient. Individuals and firms must develop a ‘culture of integrity’ that permeates all levels of their operations. This will promote the principles of stewardship of investor assets, and work in the best interests of clients, above and beyond strict compliance with the law. A strong ethics-based culture that helps people engage in and promote ethical behaviour will foster trust, lead to robust global capital markets, and ultimately benefit society. Professions can only exist within an industry when those acting with transparency, integrity, candour, and trust reach a critical mass. 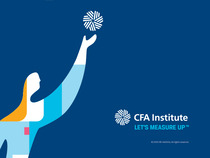 CFA Institute has long championed these values. The organisation believes that the investment industry should work for the ultimate benefit of society, and that cannot be achieved without the highest possible standards and ethics.